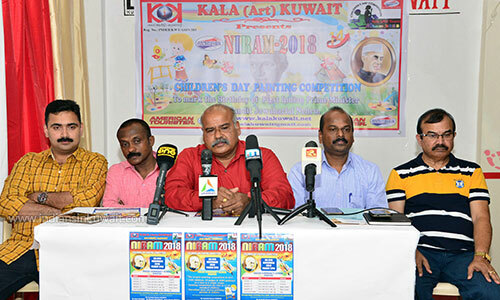 IndiansinKuwait.com - Kala (Art) Kuwait announces “NIRAM 2018” Children’s Day Painting Competition. Kala (Art) Kuwait announces “NIRAM 2018” Children’s Day Painting Competition. 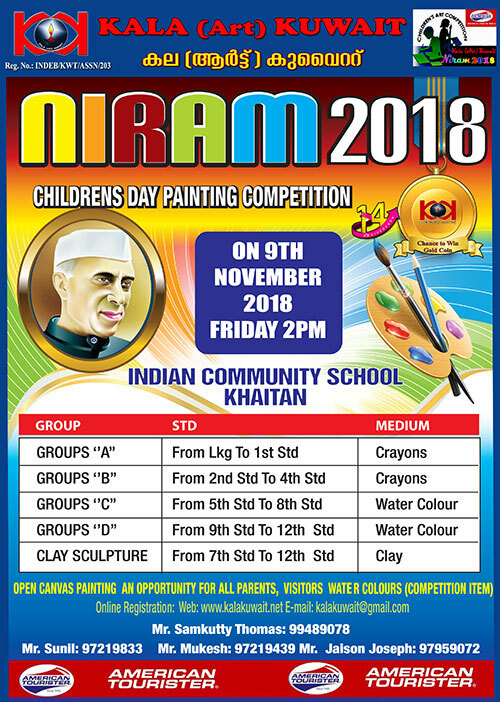 Kala (Art) Kuwait presents “NIRAM-2018” Children’s Day Painting Competition in association with ‘AMERICAN TOURISTER’, will be held on Friday, 9th November 2018 at Indian Community School, Khaitan on the occasion of Children's Day celebration by marking the birth day of Pandit Jawaharlal Nehru, the First Prime Minister of India. The organizers conducted a press meet on Tuesday, 11th September 2018 at KAK Auditorium, Abbasiya. The meet was led by Mr. Samkutty Thomas, President, Kala(Art) Kuwait, Mr. Sunil Kumar, General Secretary, Kala(Art) Kuwait, Mr. Johny Kalamachal, Treasurer, Kala(Art) Kuwait, and Mr. Jaison Joseph, Registration Convener, Mr. Hassan Koya, Sponsorship Convener, Niram 2018 Organizing Committee Members. “Children’s Day” is a day to remember the great leader, who in his quiet but determined way, laid foundation to convert a nascent nation into a world power. His contributions to India and the world would always be remembered. The Painting Competition will be conducted in four different age groups. Group 'A" from LKG to 1st Standard, Group 'B" from 2nd to 4th Standard, Group 'C" from 5th to 8th Standard and Group 'D" from 9th to 12th Standard. The media for Group 'A" and 'B" will be Crayons while Group "C” and 'D” are Water Colors. Crayons and watercolors shall be brought by the participants. Stamped Drawing papers will be supplied by the Organizers. Clay Modeling Competition also will be conducted for 7th to 12th Standard Students. Clay will be provided by the Organizers. A Marathon Open Canvas Painting for parents, visitors and Guests is conducting in a view to display everyone’s views and talents through their vivid creations. Kala(Art) Kuwait, emphasize the exclusive prizes for the winners as first place with gold coin & gold medal, second place with silver medal and third place with bronze medal along with memento & certificate. Besides the 1st, 2nd, & 3rd, there will be 50 participants to Merit Prizes and Ten (10) percent of the participants will be awarded with consolation prizes. Parents also have the opportunity to win prizes for Open Canvas Painting. The online registration will be continued until 6th November 2018. For more details, please visit www.kalakuwait.net, by e-mail [email protected] and telephone numbers, 97959072, 97219439, 97219833 and 99489078 according to Mr. Jaison Joseph, Registration Convener, NIRAM-2018.